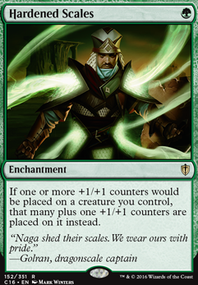 I have a deck vaguely similar to this one that uses Yisan, the Wanderer Bard as it its commander. If I had any suggestion to make, it would be that since you want to focus on hydras, put some more +1/+1 counter interactions in. You might like things like Mighty Emergence, Soul's Might, Nissa's Judgment, Hardened Scales, Inspiring Call, or Death's Presence. Also, since many hydras have an "X" in their cost, you can get more counters on them by having cards that reduce the cost, like Rhonas's Monument, Emerald Medallion, or Conduit of Ruin. Again, since most hydras are 0/0 and work off counters, a fun card to run with them is Gigantomancer, who would just give them +7/+7. There also some good hydras I'm not seeing here. Ones like Protean Hydra, Lifeblood Hydra, or Ulvenwald Hydra. I'm sure you have your reasons, but I'd consider those. 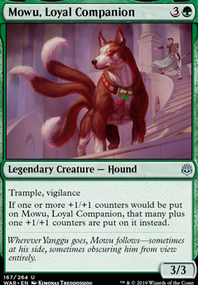 As for what's on the maybeboard, Hydra Broodmaster seems like an obvious choice for a hydra deck and I'm curious why you cut it, especially in a deck with this much ramp. Pathbreaker Ibex would do amazing work if you can guarantee at least two other big creatures attack along side it. Shamanic Revelation is a great source of draw and recovery since you're almost guaranteed to meat the ferocious requirement. Surrak, the Hunt Caller is another pick that has some real potential in this deck. The others I personally don't think much of. I have both of them right now, cutted an old Nissa's Judgment for it. There are a lot of creatures that allow you to exploit the +1/+1 counters on your other creatures. For example Abzan Falconer, Crowned Ceratok, Tuskguard Captain, Bramblewood Paragon, Battlefront Krushok, Ainok Bond-Kin or Abzan Battle Priest. At last maybe these enchantments are worth checking out: Cathars' Crusade and Hardened Scales. 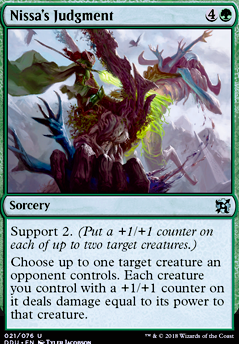 Personally i think the support mechanic from oath of the gate watch would fit perfectly for instance Relief Captain, Gladehart Cavalry,Shoulder to Shoulder, and Nissa's Judgment, there are more but just to start. also Rishkar, Peema Renegade, by using them together all your creatures now become mana rocks. 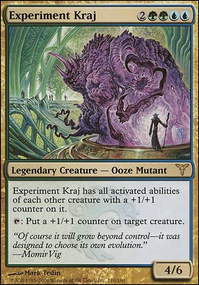 Another great draw would be Armorcraft JudgeIf you choose to use this mechanic with lots of triggered abilities to use I'd say Panharmonicon and Strionic Resonator For cuts I'd say Prime Speaker Zegana, Ichor Rats, Elite Scaleguard,and Elesh Norn, Grand Cenobite. If you want to make this competitive you will need to have more 3 ofs and 4 ofs, to get more consistency. For a start I would drop Collective Effort and Nissa's Judgment for two more Declaration in Stone. As you play, think about which cards you hope to draw next, and which cards you are most glad to see in your hand. Those are the cards you need a few more of. You will also need a Sideboard. 3x Archangel Avacyn Flip (move one out of your Mainboard). This protects against board wipes. 4x Disallow - you have in your deck, so make use of the best Counter spell. 3x Cataclysmic Gearhulk - lets you board wipe, even Superfriends decks, without losing all your stuff. 3x Cast Out - Exiles just about anything that is a problem. 2x Forsake the Wordly - takes care of Heart of Kiran or Scrapheap Scrounger permanently. Also lets you hit Enchantments. You will need to adjust your SB based on which cards prove problematic for you, in your local meta. The base for this deck is awesome, but youre going to need more and better removal. 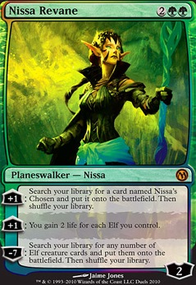 Nissa's Judgment is just way too slow. Try Immolating Glare, its great. For the creatures: Void Grafter doesn't seem necessary beacause you have no combos to really protect. You should add more Gideon, Ally of Zendikar. The card is absolutely insane. Also another Tamiyo, Field Researcher might be helpful. You dont really have enough Spirits to take advantage of Rattlechains. Instead try to play more 4-ofs to draw those great cards more often. I would make Selfless Spirit and Sylvan Advocate 4-ofs. Also more Archangel Avacyn Flip might be good, because the meta is going to be full of Zombies after the Marvel ban and people are going to be playing wraths. More green removal spells: Prey Upon or even Nissa's Judgment. 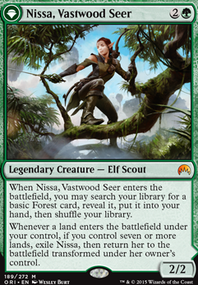 Have you considered any of the versions of Nissa that are currently legal? Also Rishkar, Peema Renegade can be some very good ramping.